High pressure in Canada is dominating the weather across the Midwest and Great Lakes currently. That trend will continue through Sunday, keeping temperatures in the 70's under plentiful sunshine. The humidity will also remain quite low through Sunday. 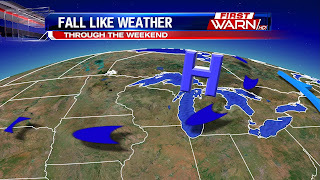 The high will begin shifting east of the area Sunday, but will still have enough of an influence on the region to keep plenty of sun in the forecast through the entirety of the Labor Day Weekend. In fact, the entire holiday weekend will be dry with mostly sunny to partly cloudy skies expected each afternoon. Temperatures will warm from the upper 70's on Saturday into the lower 80's Sunday and middle 80's on Labor Day itself. It won't be the most ideal weather for swimming on Saturday, but Sunday looks better, and Monday looks perfect as we begin to heat back up. Of course the unofficial end to summer is Labor Day, which is when many pools and water parks close for the season. If you want to take one last dip at the local pool, Monday looks fantastic! ...free air conditioning arrives through the weekend. Today's the day! We've been talking about the cooler and dry air set to arrive today, all week long, and it's finally here. While you might feel just a bit of humidity this morning, that won't be the feeling all day. Our dew points continue to fall from the low 70's that was observed yesterday to the low 60's and then the 50's by tonight. A trough in the jet stream up above in the atmosphere, helps to dislodge that cooler and drier Canadian air, along with sinking surface high pressure. Our winds will stay out of the north today and the next few days as we head into the holiday weekend. Peeking into next week, we notice a return of more humid and warm air. We make it make into the mid and possibly upper 80's along with dew points back into the low 70's. Beautiful Week and Weekend Ahead! Temperatures and dew points have been quite high over the past few days. That will completely change by the time we get to Wednesday afternoon. A strong Canadian high pressure system will anchor itself north of Lake Superior beginning Wednesday. It won't move much at all through Saturday, which will keep our pattern very quiet. It will also allow cooler, less humid air to filter into the Midwest and Great Lakes. Temperatures won't exceed 80° until potentially Sunday afternoon when our winds start to turn southerly again. Humidity values will be low with dew points in the upper 40's and 50's, which will make it feel much more fall-like as we enter September on Thursday. Clouds will be few and far between Thursday, Friday and Saturday. The next chance of rain arrives just in time for Labor Day Monday with an approaching cold front, but that system is still too far out to pinpoint any details at this time. Not Done with the Rain Yet..
....more storms possible this afternoon. It was a soggy start to the work week with heavy rain producing storms that developed around 1pm yesterday afternoon. They slowly moved NNE across northern Illinois and southern Wisconsin, dumping inches of rain. Storms cleared the area around 9pm but then overnight, ahead of moisture and warm air advection, more storms developed dropping more rain through southern portions of the Stateline area. We can expect some dry time today, with more storms possible after about 1pm. These will form ahead of a mid-level disturbance, and will linger past sunset. The coverage of the heaviest rain will be just south of I-80 and I-88, closer to a stalled boundary. However, we will still see periods of heavy rain this afternoon. As we've mentioned, the localized flash flooding is due to heavy rain producing thunderstorms that are very slow moving. A few components have come together to allow for this to happen. First, a ridge situated in the southeast and extending up into the Ohio River Valley, is actually directing the flow in the atmosphere, because of this southwest flow is drawing up quite a bit of moisture and warmth, something meteorologists call warm air advection, and moisture advection, right over northern Illinois. Our dew points are again in the low 70's and the potential moisture in the atmosphere is approaching 1.5" again today, a lot like yesterday. Our upper level winds, or jet stream winds, are also known as our steering winds. They will typically help to drive high and low pressure systems, cold fronts, and even storms. Currently our jet winds are zonal, meaning flowing from west to east. But these typically fast moving winds are actually rather weak, so instead of these storms marching quickly east, they have been very slow. When you have high amounts of moisture and heavy rain producing storms that move slowly, they are going to dump a lot of rain over certain areas of the region. This is basically what happened yesterday, and we still have the potential this afternoon as well. The greatest coverage of heavy rain looks to be just to the south of the area, as mentioned. This area is also highlighted for excessive rainfall by the Weather Prediction Center. Plenty of rain fell Monday across the Stateline with many locations recorded upwards of 2-4" of rain. Some of those locations include Dixon, Sterling, Rockford, Belvidere, Genoa, and Kirkland. Many other areas saw moderate to heavy rain, but the rain totals weren't as extreme. 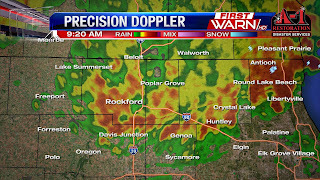 Flash flooding was also reported in downtown Rockford, Dixon, and Belvidere as a result of the intensity of the rain. The reasoning behind the storms dumping copious amounts of rain is the fact that we had ample heat and moisture available. Precipitable water is a tool we use to analyze how much moisture is in the atmosphere. When those values exceed 1.5", heavy rain is a distinct possibility. Monday we had totals of 2". As a result, the atmosphere was prime for heavy rain. In addition, the storms didn't move much at all due to a lack of upper-level winds. There was nothing in place to push the storms along, which led to flooding in portions of the region. A cold front will swing through Tuesday evening. Ahead of that will again exist an air mass supportive of isolated thunderstorms and heavy rainfall. Once that front passes Tuesday evening, much cooler and drier air will filter into the area. 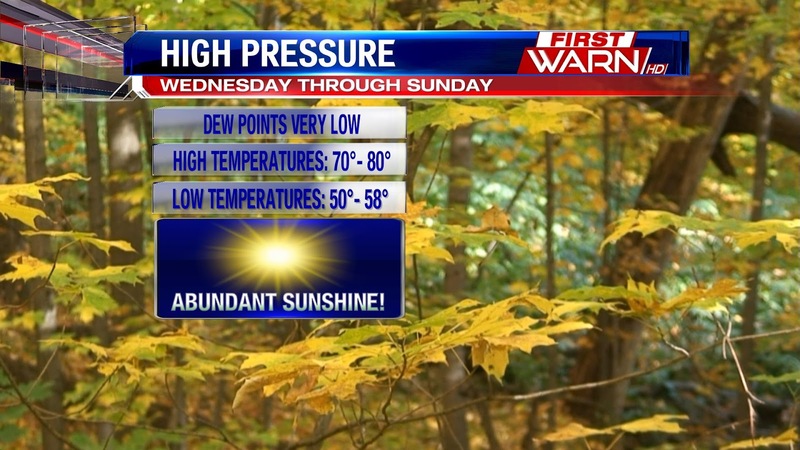 Temperatures by Wednesday will be in the 70's for highs, and likely won't exceed 80° until possibly Sunday. Overnight lows will return to the 50's, and humidity values will be very low, making it feel more like fall as the calendar flips to September later this week! Over the weekend multiple showers and storms brought heavy rain to the Stateline, mainly in Whiteside and Lee counties where we had Flash Flood Watches and Warnings. 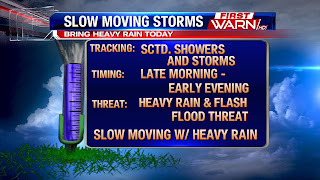 We aren't done with the heavy rain however, slow moving storms today will once again bring a threat for high rain totals and localized flash flooding. While the atmosphere lacks distinct forcing, storms are still probable across the area because of a few factors. High pressure this morning is centered near the central Great Lakes, but will move east by mid morning. As this happens, return flow on the backside of the system will bring increasing humidity across the area. Already modest dew points in the 60's will rise into the low 70's with southerly winds in place. With sunshine and these increasing dew points, showers and storms will then develop. Because there is not a lot of forcing or lift in the atmosphere it is harder to time out when and where the storms will develop. They will however be likely today across northern Illinois and northwest Indiana. The threat for severe storms is low but a few stronger storms can't be ruled out that will produce gusty winds. 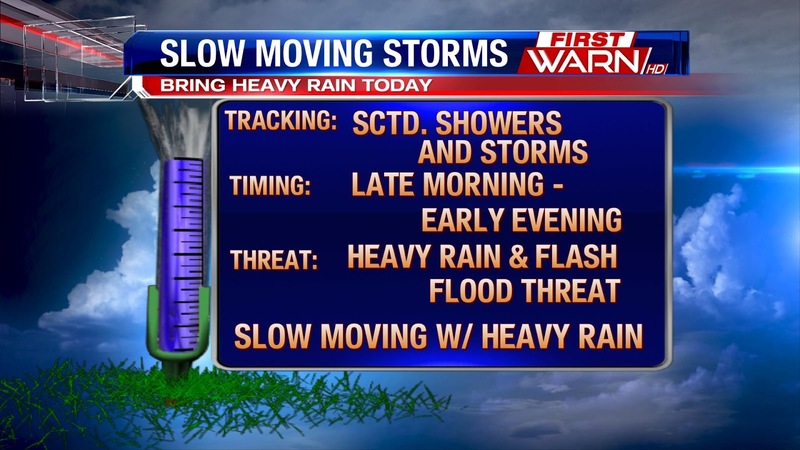 The threat we are tracking today is heavy rain producing storms and even localized flash flooding. In the low levels of the atmosphere there is a lot of moisture to work with, something referred to as PWAT values, which will be rising to 1.5" to 2". We like to use the analogy that if we think of the atmosphere as a sponge, and we were to squeeze out the available moisture or PWAT we could see up to 2" of rain fall. Also in the low levels of the atmosphere the 'flow' or wind speed is rather slow, meaning the storms we see today will be slow movers. With these two factors, high rain totals and localized flash flooding is possible. Storms will be diurnally driven, meaning with the heating of the sun storms will be able to be sustained, but once the sunsets the storms essentially lose the energy and will faded away. However, a couple isolated storms will linger into the overnight. Another day with storms for Tuesday with an approaching cold front, this will bring scattered showers and storms in the area. A shortwave trough or small low pressure system in Canada will move eastward, but it's trailing cold front will sink south through the area tomorrow firing up scattered showers and storms. Once again the severe threat is fairly low, but a few stronger storms will bring gusty winds and heavy downpours. Good news is, the weather turns quite Wednesday into the rest of the week. Certainly an active night for our southern counties Whiteside and Lee this evening as thunderstorms continue to form over the same areas. A Flash Flood Warning is in place for Whiteside County until 11:15 this evening and a Flood Advisory is in effect until 8:45 pm for Lee County. More than 2 inches of rain has fallen in a number of areas that were already saturated from rains on Saturday. Water has been reported to be completely covering Highway 30 near Sterling this evening, and many other roads will be impacted as well. Have a plan in place especially if you live in low lying areas to be able to exit to higher ground as needed and if you should come across a water covered road, do not attempt to cross it. Even small depths of water can be very powerful. Turn around, don't drown. The storms should begin to diminish later tonight by midnight. We will again have chances of rain and thunderstorms Monday and Tuesday before a cold front moves through, drying us out at least until the weekend. We've been in a very cyclical pattern all summer, with generally warm and stormy weather interrupted regularly by storm systems that break the heat and humidity - at least for a few days! The storm track has been in southern Canada for some time which is typical for this time of the year. It will start to shift further south in the coming weeks and months as we head into fall. The pattern will be the same this week with warmer than average temperatures that will be broken on late Tuesday or early Wednesday with our next storm system located in southern Canada. A cold front associated with the storm will push through bringing in a chance for rain and thunderstorms, followed by clearing skies, cooler temps and thankfully lower humidity. The month of September is predicted to be warmer than average so we should expect increased temperatures to return, but at least we are getting some nice breaks. We all know what is eventually coming - so lets enjoy the warmth while we have it! It sure felt like fall on Friday with temperatures topping out in the upper 70's underneath a mostly cloudy sky. The humidity was low, which helped make it feel very nice. That won't last, though, as a disturbance will bring rain and some storms Friday night into early Saturday morning. As that occurs, much higher dew points will surge north, making it feel quite humid by the time you wake up on Saturday morning. That humidity won't be going anywhere this weekend. In fact, the dew points will surge into the upper 60's and lower 70's Saturday, and that will last through the middle of next week. Temperatures for the weekend will be warmer than we have seen lately. Highs on Saturday beneath a mostly cloudy sky will reach the lower 80's. Sunday we will warm a little more than that into the middle 80's as skies look to remain mostly cloudy. Once Saturday morning's rain exits, we look mainly dry for the remainder of the weekend. Isolated showers and storms are possible at just about any time, but there is no significant chance of rainfall through the weekend. However, a stronger storm is possibly with Saturday morning's activity, in addition to any activity that develops later in the day. The Storm Prediction Center has the entire area in a "Marginal Risk" for severe weather through the day on Saturday. But the overall threat looks quite low. Many areas may not even see a shower or storm develop Saturday afternoon and evening. Friday finally brings a drier forecast, unfortunately that won't be the case this weekend. A trough and wave of energy in the jet stream will eject out of the Rockies today and move closer to the Stateline. Ahead of this, our flow in the upper levels of the atmosphere will be southerly and will strengthen. 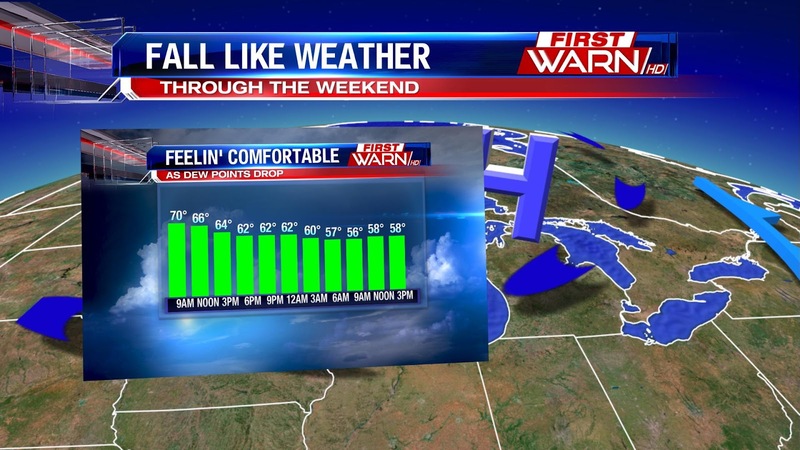 This brings a ton of moisture into the Stateline, as dew points surge back into the 70's. High pressure will keep northern Illinois fairly dry through the evening, but it continues it's northeast movement tonight out of the area. A strengthening low level jet will veer from southern Iowa today overhead early tomorrow, which will allow the rain and storms from Iowa to also veer eastward. You'll want to keep an eye on the radar if you have outdoor plans, as we look to see periods of rain and even a few storms through Saturday. Temperatures only warm to 80° but it will be increasing humid. Along with increasing dew points the upper levels of the atmosphere will receive more moisture, this will once again bring the threat for heavy rain at times. There could also be a few stronger storms but threat for that is fairly low because thick cloud cover will limit instability. The rain threat will slowly decrease into Saturday evening with small rain chances into next week. Well, throughout the week we have been monitoring the forecast for Friday. 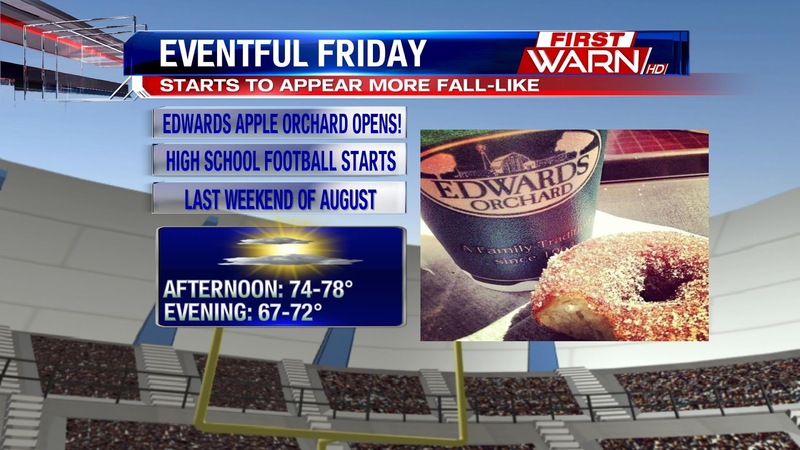 That's because Edwards Apple Orchard opens up for the season! We have seen some rain and storms through the week, but we kept suggesting the weather would cooperate on Friday. And, now that we are approaching Thursday evening, the forecast models have a good handle on what Friday will bring. It still looks dry. It still looks like temperatures will top out in the middle to upper 70's. It still looks like humidity values will be low, making it feel more like fall than late August. The only significant change that has occurred throughout the week has been cloud cover. It appeared as though an area of high pressure would deliver mostly sunny skies to the region, but as days have passed, slightly more cloud cover has been introduced each day. Now, we are expecting mostly cloudy skies, but at least it will be a dry day. So if you have been craving those famous apple cider donuts, some warm apple cider, or fresh apple pie, Friday looks like a perfect day to cross off those cravings! After periods of showers and storms yesterday, you definitely noticed the humidity or sticky feel if you stepped outside. That's because we had dew points in the 70's, and it's also what led to the heavy downpours overnight and early this morning. But do not fear - relief is already moving in! A cold front that was to the northwest of Illinois yesterday is currently sinking south of the area and our winds are switching direction to the northwest. This will tap into cooler and drier air that will begin to filter in through the afternoon. Dew points will move from the low 70's to the upper 50's by tonight and tomorrow. 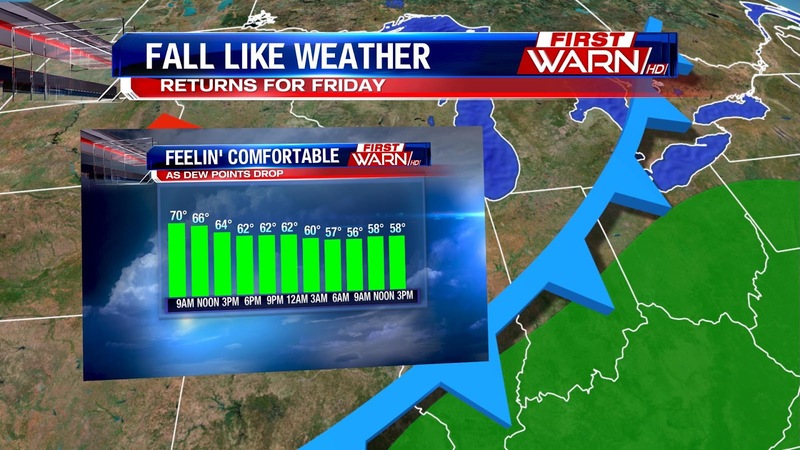 That means for us, more sunshine and a much more comfortable feel through Friday evening. Unfortunately the pleasant weather doesn't stick around through the weekend, showers and storms arrive early Saturday morning and stick around through the afternoon. It has been quite warm and humid over the last 24 hours in the area, and that will continue for the majority of Thursday. Rain and storms moved through early Wednesday morning, and that will again be the case late Wednesday night and early Thursday morning. Some of the rain could be heavy. In fact, Whiteside and Lee Counties are under a Flash Flood Watch. 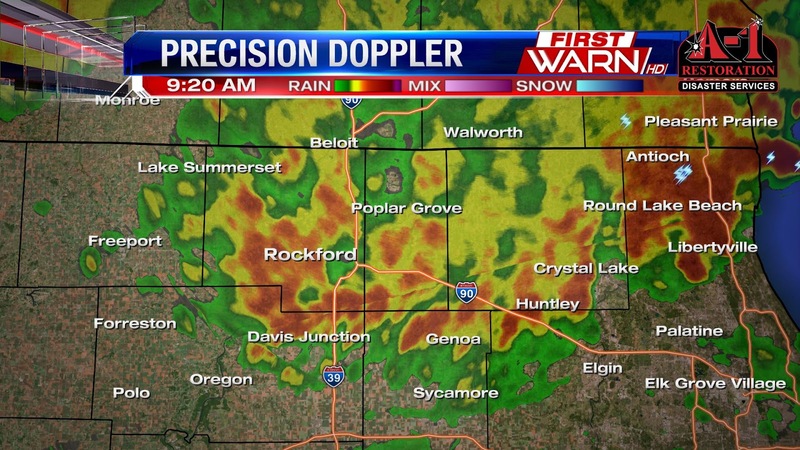 The heaviest of the rain will remain south of US 20. The rain ends into Thursday morning before a an area of high pressure briefly dictates our weather Thursday evening through Friday evening. That will allow clearing skies later Thursday into Friday. Temperatures Thursday night will be allow to fall into the upper 50's before only rebounding into the upper 70's Friday afternoon. 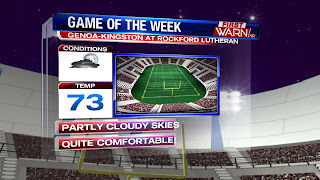 The all-important first Football Friday forecast is still looking great. Temperatures for the games should be in the lower 70's with partly to mostly cloudy skies expected. It will be dry, but rain and storms return around midnight and last through Saturday. The good news is Sunday, Monday, Tuesday, and Wednesday all look mainly dry with just very isolated showers and thunderstorms possible each afternoon. No day during that 4-day stretch has a precipitation probability above 20% as it looks currently! It was a soggy Wednesday morning with a MCS or Mesoscale Convective System(large complex of storms) morning ENE though the Stateline area. Janesville in southern Wisconsin picked up just under an inch; and Dixon who saw 3-5" last week received 1.61" of rain this morning. Much of today will end up being dry, but more storms are forecast to redevelop late today ahead of our next cold front. These will bring more heavy rain producing storms across the region, though it is expected to be more scattered in nature. Still, Whiteside county who picked up heavy rain this morning, will likely see more rain tonight. Because there is a lot of available moisture to work with in these storms later on ( our dew points are in the low 70's) and the ground is already saturated from rain this morning, any additional heavy rain tonight and early tomorrow morning will bring a threat for localized flash flooding. 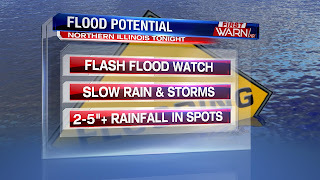 Because of this, the National Weather Service has issued a Flash Flood Watch for Whiteside county from 7pm through Thursday morning. Shower and storm activity looks to fire up around 7 to 8 pm tonight and will linger into the morning. The converge in any rain and storms we see will likely stay scattered, with the strongest storms to the west and south of the area. Storms and showers will then sink south late tomorrow morning into the early afternoon along the cold front and keep the general storm activity to the south and east for most of Thursday. August 24th is "Weather Complaint Day" here in the United States. It rarely receives attention, but it has been around for some time. With the very nice, fall-like weather we've been experiencing lately, it may be difficult to think of a weather complaint here locally. However, rain and storms are expected to move in late Tuesday night and Wednesday, which may prompt a few complaints. By the time we get to Friday, beautiful weather will return again for 24 hours. That is perfect timing for a few events set to occur on Friday. First, Edwards Apple Orchard will open for the season. Secondly, high school football begins across the Stateline. Temperatures will reach the middle to upper 70's under mostly sunny skies. By the evening, temperatures will fall back into the upper 60's. 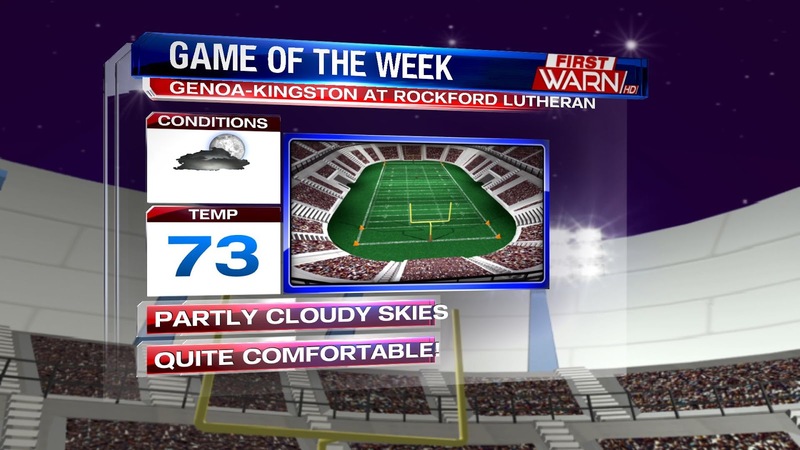 So if you plan on venturing out to see your local high school football team compete, a light jacket may be necessary. Otherwise, it's going to be an absolutely perfect fall-like day! It was a refreshing weekend with temperatures in the low to mid 70's, even 10° below average for many on Sunday. Monday morning was a crisp one, with a few spots falling into the upper 40's and highs were just a touch below average, about 3 degrees below. Tuesday and Wednesday bring average temperatures in the low 80's. But another potent cold front will pass into Wednesday which will bring scattered showers and storms through the morning and into the evening. Then temperatures again will fall below average Thursday and Friday, and we look to stay in the mid 70's Friday afternoon. Long range models however don't let the fall-like weather stick around long, our jet stream lifts to the north by the end of the weekend and once again temperatures will be on the rise. We will be on the edge of a high pressure system centered near Florida, which will bring scattered rain chances and a little more cloud cover into the start of next week. If we do see more clouds and rain temperatures will make it into the mid 80's, but if we can stay dry we have the potential to see the upper 80's next week. It has certainly felt like fall over the last 48 hours or so, with high temperatures in the 70's and overnight temperatures in the 50's. In fact, Freeport and Rochelle bottomed out at 49° Monday morning! A return to highs in the 80's with higher humidity is expected by Tuesday. A cold front will also be a part of that equation on Wednesday. 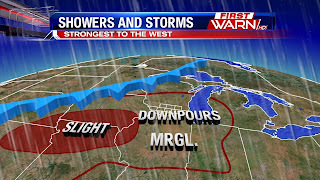 The front will be the focus of scattered rain and thunderstorms on Tuesday to our west, and on Wednesday here locally. The threat is there for some strong to severe weather as well. The image above shows the threat for severe weather on Tuesday. The next image shows the severe weather threat as we head into Wednesday. Per the Storm Prediction Center, some stronger storms are possible. However, a widespread severe weather event is not anticipated. The latest forecast models don't suggest overly impressive severe weather parameters. Nonetheless, due to the nature of the cold front and the variables that will be in place, a marginal risk for a strong to severe storm exists. Rainfall totals may exceed one inch in many spots by the time the rain concludes late Wednesday. Totals may shape up to look like what our FutureCast model is suggesting. That could lead to isolated bouts of flash flooding, but the overall flood threat is not all that high. Overall, scattered rain and storms are anticipated to arrive late Tuesday night and remain in the forecast through the vast majority of the day Wednesday. By Thursday we are looking dry with highs in the lower 80's! After a great Sunday, we will have a very nice start to the week as high pressure remains in control with mostly sunny skies and we will warm a bit to the upper 70's on Monday. The good weather continues into Tuesday with warmer temperatures into the low 80's. Our weather will start to change late Tuesday night into Wednesday morning as a storm system that just came ashore in British Columbia will cut across the Northern Plains, the center of the storm will be located in the Northern Great Lakes. The system will pull warmth and moisture again from the Gulf of Mexico and as an associated cold front approaches, rain and thunderstorms will be triggered. Because of the large amount moisture being pulled from the Gulf, the storms could have the potential for heavy downpours, a scenario that we've experienced a number of times this summer! After the storms and cold front pass on Thursday, skies will clear and set the stage for a cool and comfortable Friday and a nice start to the weekend! After a very warm summer (averaging almost 2.2 degrees above average), we've certainly had our share of steamy days along with high humidities, sometimes feeling as though we live in the tropics! The next week will be quite a different picture, however as our temperatures will actually average below normal! Two storm systems originating in Southern Canada are ushering in cooler than average temperatures and lower humidity, making our weather feel more like late September than end of August. You may even need a jacket as low temperatures for the next few days will drop into the mid- or lower 50's. The nice conditions will stay with us through Tuesday with slowly increasing temperatures. Our next shot at rain comes late Tuesday night into Wednesday morning as yet another cold front pushes through introducing comfortable air again Friday through the end of next weekend. Enjoy! A strong cold front is located just to our west this evening. That will continue to slowly progress towards the region tonight into Saturday. Ahead of it our rain chances are pretty slim with isolated showers possible through 1-2 AM. As it gets closer later in the night, our rain--and to a lesser extent storm chance--will increase. The rain could be heavy at times, but extremely heavy rainfall is not anticipated. Severe weather does not appear likely either. However, a stronger storm cannot be completely ruled out due to the nature of the cold front. The rain will likely begin to clear after 1-2 PM from west to east on Saturday. Skies should still remain mostly cloudy on Saturday afternoon and evening. Winds will begin to pick up during the day, with gusts upwards of 25-30 MPH a distinct possibility. Some areas could pick up an inch or so of rainfall, but I think any totals much higher than that will be very isolated (as the projected rainfall total map shows). Just about every back yard in the Stateline should see a healthy 0.25-0.50" by the time the rainfall comes to an end Saturday afternoon. Behind the front, much cooler air will filter in with highs in the 70's Sunday and Monday. Overnight temperatures will hit the 50's--and potentially the lower 50's--Saturday night and Sunday night. An MCS that moved through Wisconsin overnight has continued to propagate to the south and east had shown new convective development on the southern edge of the system in southwest Wisconsin. This line and attending Mesoscale Convective System are currently sinking southeast through the area and have continue to weaken. there were reports of pea sized hail, but the biggest threat with the storms was heavy rainfall. The storms were not picked up but model guidance at all, and actually developed on small synoptic scale features. This particular line of storms developed from the outflow boundary of the MCS in Wisconsin. Outflow boundaries are essentially small cool fronts left behind from the outward rush of cool air from storms. These areas then allow for new convection to develop. These storms tracked in an east south east fashion, because that is where more instability was present. As storms continue to die down and move out of the area, we will have some dry hours through midday today and into the afternoon. Another disturbance will rotate nearby that will once again bring more scattered rainfall through the area. A stronger system is then forecast to make an appearance in the Stateline late tonight and into Saturday. The mid-level disturbance that is currently near Montana with dive southeast into the Mid-Missouri Valley early tomorrow, in turn then deepening the surface low pressure in that area. 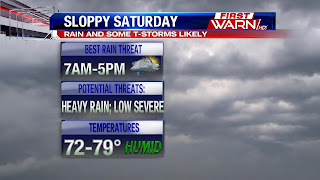 This along with a cold front will bring mainly the threat for heavy rain early Saturday morning through the afternoon. There could be a few stronger storms, but overall instability is limited and heavy rain will be a bigger factor. Storms and showers clear around dinner time Saturday and then temperatures crash into the low 70's by Sunday. Another night of heavy rain and thunderstorms is expected across portions of the area. This time, though, it is expected to impact many more people than Wednesday night's storms did. A line of strong storms in southern Wisconsin and northeastern Iowa will continue diving towards the southeast slowly this evening. That will bring heavy rain, thunder and lightning, and gusty winds late this evening into the overnight hours. Ahead of this, a few storms have blossomed. They have been prolific rain-producers, in addition to producing lightning and gusty winds. All of this activity will swing through northern Illinois and southern Wisconsin, creating a very heavy rain and flooding threat. 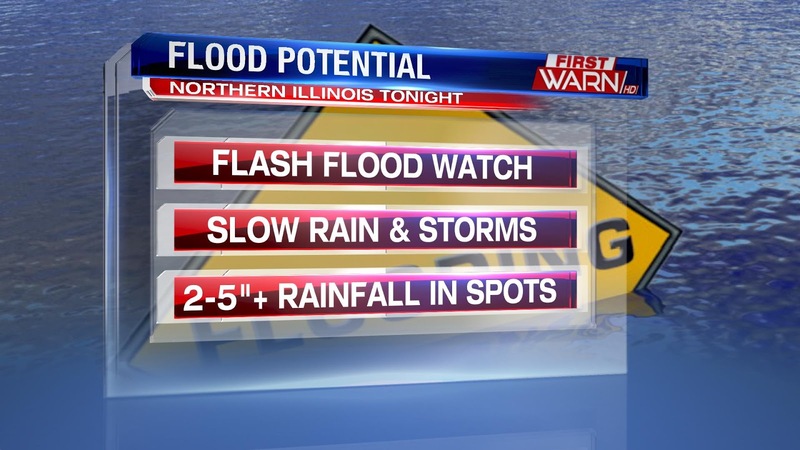 In fact, portions of the Stateline are under a Flash Flood Watch through 6 AM Friday for heavy rain in excess of 2-5". The storms will again move slowly, which combined with plentiful moisture in the atmosphere, will allow for those higher rain totals to be achieved. The heaviest, more concentrated areas of rain will come to an end before sunrise. Remember to report flooding to the National Weather Service, if you can do so safely. In addition, never drive into a flooded area, and never approach an area that you think may be under water. storm that tracked east trough Whiteside county through Ogle and Lee counties before fizzling in DeKalb county and sinking southeast. Route 26 at route 52 was closed with water up to 2 feet over the road, and nearby businesses were flooded. Lowell Park Road also closed due to flooding. Water was reported over the road on Palmyra road just off of Route 2. Also three businesses in downtown Dixon were flooded, along with many filled ditches. Some emergency management officials measures 3 inches of rain one mile NW of Dixon around 4am this morning. One report relayed to the NWS office of 4.60" of rain in southwest Dixon. All eyes are on a strong, late-summer cold front that is poised to move through the area Saturday. Earlier this week it looked like it may bring very heavy rain for over 36 hours, in addition to a chance of severe weather. However, the latest forecast model runs are suggesting rainfall to last roughly only 12 hours. In addition, instability and wind shear both look to remain on the low side. As a result, the severe weather threat looks quite limited at this time. That does not mean a stronger storm won't happen, but the threat is minimal. Rainfall does still have the potential to be heavy at times with a humid air mass expected to be in place immediately ahead of the front as it slides through. Temperatures will likely only top out in the 70's as a result of the enhanced cloudiness and expected rain. Once Saturday evening arrives, it looks like the bulk of any concentrated rain will be ending. For morning and afternoon plans, it will be a good idea to have umbrellas or tents available. Any evening plans will likely be unaffected, which bodes well for the Mo Pitney concert set to begin at 7 PM at the Winnebago County Fair. After the rain comes to an end, cooler air will filter in with high temperatures in the lower 70's on Sunday and middle 70's on Monday. It's been a hot and humid summer across northern Illinois and southern Wisconsin, and we aren't done with the heat just yet. More steamy weather on tap for Thursday and Friday with highs in the upper 80's and heat index values approaching the low 90's. Southerly flow will bring more moisture into the area increasing dew points, and in turn increasing the humidity. This will then set the chance for heavy rain producing storms on Saturday with a potent end of summer cold front that will dive southeast from the Northern Plains. This cold front will bring widespread showers and storms through Saturday afternoon. Not only that, but the front will also bring a big drop in temperatures from the upper 80's to the upper 70's by Saturday and then dropping again into the low 70's through Sunday! 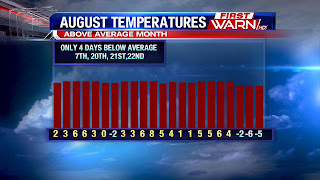 This is about ten degrees below average for August, which is 82°. The cooler weather extends into a portion of next week with sunshine and highs in the mid 70's Monday and Tuesday before temperatures warm up a bit more. The Climate Prediction Center keying in on this trend through the end of the month through most of the country. The only areas with a probability to see above average temperatures will be both the west and east coasts looking to stay a bit warmer. 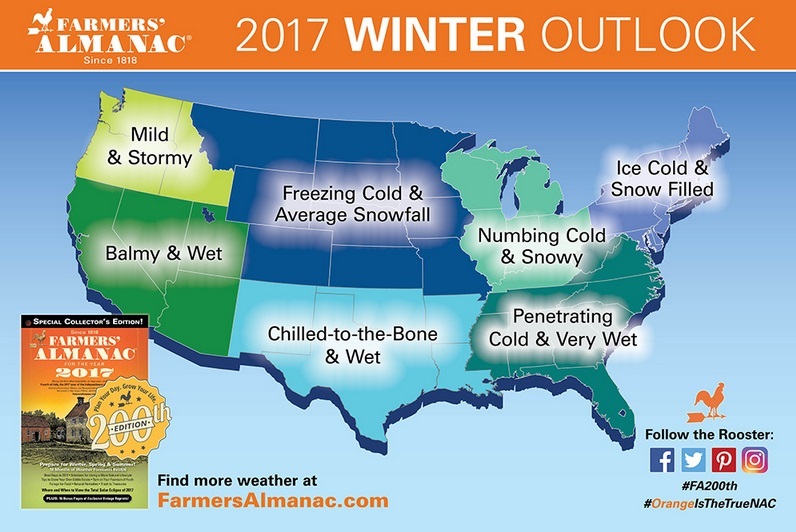 The infamous Farmers' Almanac winter outlook is now available to the public. It has been around for quite some time, and still receives extremely large amounts of publicity and praise. But should it? This winter is expected to be extremely cold and snowy in northern Illinois and southern Wisconsin, per the Almanac. The outlook specifically says November will feature snowy and cold weather, especially during the middle of the month. It also says both December and January will feature a mixed bag of wintry weather for the United States as a whole. The worst of the wintry weather is anticipated in February, which is when the worst of the cold and snow is expected in the Upper Midwest, Great Lakes, and Northeast. It says areas in the northern tier of states could see temperatures as cold as -40°. Of course, it is important to remember that this outlook needs to be taken with a grain of salt. It is difficult enough to create a highly accurate 7-day forecast, but to accurately predict the weather a good half-year ahead of time is nearly impossible. Latching on to general patterns this far ahead of time is in the realm of possibility, as NOAA puts out a winter forecast during the summer months. But NOAA uses more of a scientific approach compared to the Farmers' Almanac, which incorporates some meteorology, but also uses a good deal of past occurrences. 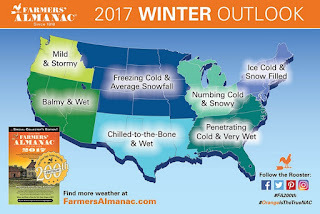 It's something many take into account, but it isn't wise to completely base a winter forecast off of the Farmers' Almanac. However, it may be on to something. A La Niña pattern is very possible this fall and winter. According to NOAA, there is a 50-60% chance of that happening. That would allow this winter to have the potential to be colder and slightly more snowy than last winter, which was dominated by an El Niño pattern. It's something to watch! We have missed out on the majority of the heavy rain that has plagued areas to our south over the past several days. That is because the stalled out frontal boundary and areas of low pressure riding along that boundary have largely remained just far enough south to keep nearly all of the moisture away from far northern Illinois and southern Wisconsin. Other than a few isolated showers or thunderstorms Tuesday into Wednesday, we should continue to stay mainly dry through the end of the week. By Friday, a cold front will push closer to the region from the northwest. This front will bring two big time changes to the Stateline: an almost guaranteed chance of rain and storms and fall-like temperatures. As a result of the strength of the front, the storms that move through late Friday night and Saturday have the potential to be strong, but a large severe weather event does not look very likely at this time. The greatest threat for severe weather will remain just to our west from Kansas to Missouri to Iowa and Wisconsin. Regardless, a decent amount of rain is possible with totals possibly exceeding 1" by Saturday evening. Behind the front will exist much cooler air. It will feel more like late September or early October than late August. High temperatures will hold in the middle 70's Sunday and Monday with overnight lows int he middle 50's! Heavy rain and flash flooding has afflicted Louisiana this weekend dropping over 30 inches of rain in a few places; there have been 20,000 water rescues, and 6 people have tragically died. That low pressure, with abundant moisture from the Gulf with progressively lift north today and will bring heavy rain and possible flash flooding through portions of Illinois and Indiana. However, the Stateline looks to stay just north and west of the track of the low pressure. A few showers will be possible in southeastern portions of the Stateline later this afternoon, but more likely we will see rain tonight. As we continue through the rest of the week we have periodic rain and storm chances through Wednesday night because of passing shortwaves (small low pressure systems) aloft along with abundant moisture in the low levels of the atmosphere. 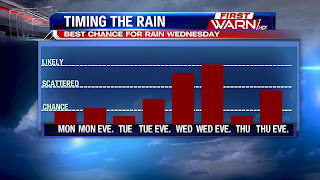 Tuesday holds a late day chance for rain but Tuesday evening looks to hold slightly higher probabilities. Wednesday and Wednesday night will also hold periodic showers and storms with a stronger shortwave that will passing close by; along with a low level trough or dip in the jet stream at the surface. Next up for rain and storm activity will be late Friday into Saturday with the passage of a cold front ahead of yet another trough in the jet stream that will be even deeper which will bring much cooler weather. Temperatures Thursday and Friday will warm up into the upper 80's and then temperatures fall into the mid 70;s over the weekend. 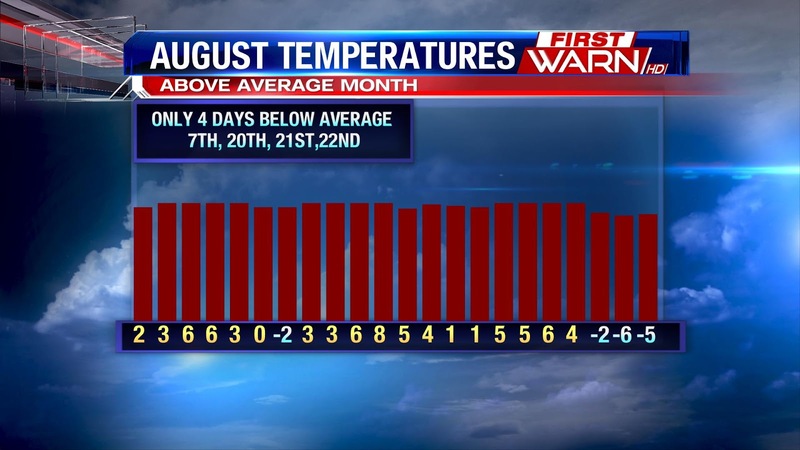 We've certainly been enjoying a warm summer so far and overall, the year has been above average. That trend will continue as the Climate Prediction Center released its' forecast for temperatures for the period of September thru November. Our temperatures have a good probability of continuing above average, while temperatures to the Southwest, South, Northeast and Northwest will likely be above average and portions of the Southwest will be much above normal! For those that like the warm weather, this is good news. Part of what is driving the warmer temperatures are very warm Pacific waters off the coast of Alaska, which is the origin of many of our weather systems, especially in the fall and winter. Of course, these forecasts are updated regularly so we'll let you know if anything changes. For now, however, it looks like summer might have a gradual and smoother transition to fall! Heavy Rain Threat Early Week? Heavy rain has been affecting portions of Louisiana and Mississippi recently. The rainfall has been associated with a deepening, slow-moving area of low pressure drawing in plentiful Gulf of Mexico moisture. That has led to some totals around and exceeding 24". As a result, there have been well over 1,000 water rescues and two fatalities. The situation likely won't improve for a few days with a stalled out stationary boundary set up through the Mississippi Valley area. That front, combined with low pressure, will continue to support an active pattern with heavy rain in the forecast from New Orleans to Memphis to Cincinnati into early next week. In fact, an additional 5-9" or more of rainfall is expected in parts of Louisiana, Arkansas, Missouri, southern Illinois, Kentucky, and southern Indiana. That will aggravate the already saturated ground in those locations, which will lead to a significant flooding concern from the Gulf of Mexico northward to the Ohio River. In Louisiana, some rivers will crest more than four feet above their respective record crest. For northern Illinois and southern Wisconsin, low pressure will remain just far enough south into early next week to keep mainly dry weather in the forecast. A few isolated showers are possible Monday, Tuesday, Wednesday, and Thursday, but the concentrated rainfall will remain along and south of a St. Louis to Champaign-Urbana to Indianapolis line. If you are an astronomer, astrologist, or if you just simply like looking up at night to see what you can spot, you may be disappointed tonight. That's because the Perseid Meteor Shower will be seen tonight, but our forecast will essentially wipe that viewing out. A deepening low pressure system over northern Illinois will continue to spawn a few isolated rain showers through the evening. That isn't the big problem, though. The problem will be the extensive cloud cover that will be present through the night as a result of the low pressure system and plenty of moisture in place. A break or two in the cloud cover may be possible, but overall our viewing conditions will be quite poor in the Stateline. If you want to see the meteor shower you will have to travel well to the north and northwest. Areas such as far northern Wisconsin, Minnesota, western Iowa, Nebraska, South Dakota, and Kansas will have excellent viewing conditions. Morning Rain Fades, but Not Done with the Rain Yet. Steady to at times moderate rain is continuing to track east across the Stateline, while lightning strikes in the southwest Chicago suburbs. We've already picked up quiet a bit of rain across the entire area, with some of the highest totals near the Wisconsin border as well as near Whiteside County. Sterling received over 3.50" in the passed 24 hours! Unfortunately, we aren't done with the rain for today, with more storms possible this afternoon. There are a few questions still in place about storm activity, but expect storms to develop in far eastern Iowa and northwest Illinois this afternoon. They will then spread east through the late afternoon and early evening hours. 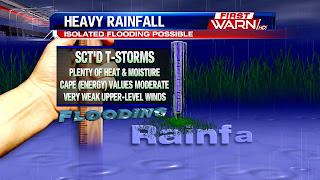 The biggest concern is still heavy downpours and torrential rain, which will bring a threat of localized flash flooding. This is why there is a Flash Flood Watch in place until midnight tonight for for most of northern Illinois and southern Wisconsin. However, a few strong to severe storms will be possible with heavy rain, a lot of lightning, and locally strong wind gusts. Expect rain and storm activity to diminish this evening and overnight.